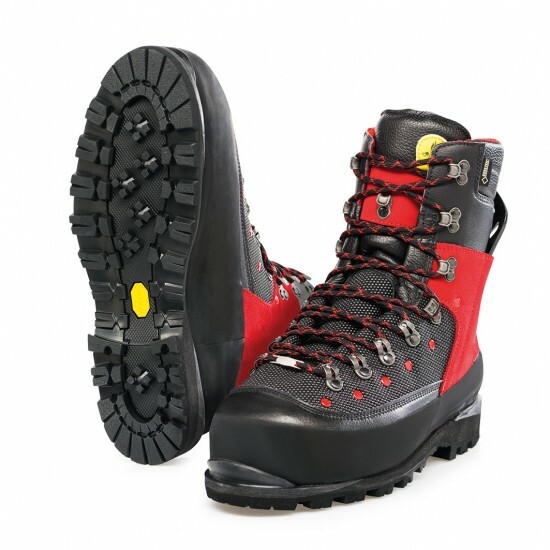 The Pfanner Matterhorn Chainsaw Boots incorporate the unique Vario Support System (VSS) in the heel area providing excellent support and shock absorption, especially when walking on steep terrain. When walking on even ground or driving a vehicle, the VSS insert in the heel can easily be removed. Manufactured using the highest quality leather, the durability of this exceptional boot is further enhanced with the application of ceramic coated discs on the front surface area. The ceramic discs provide protection against wear and abrasion and are highly heat resistant. The Vibram mountaineering sole provides excellent grip, with the narrow outer sole aiding effortless walking. Nano-active soles and shock absorbing mid soles make the Matterhorn extremely comfortable to wear throughout the whole working day. The boot seams are double stitched and riveted at the most wear and scrub prone areas and an all round rubber edge gives buffer protection. A Gore-Tex membrane is also incorporated to provide waterproof qualities. Roller eyelets make lacing up quick and easy.